Measures approximately 11 ½” x 8” x 2 ¾”. We reserve the right to substitute items of a similar value in our specialty assortments. Note: The design of the basket itself may differ from what appears in the photo. At Big Island Candies, we take extra steps to ensure your gifts are handled with the utmost care and shipped to your destination without any worries. From customized packing with thoughtful consideration to keeping mindful of weather temperatures, we guarantee that your order will arrive at its special destination in the best condition possible when you ship through us. Because of the high perishability of our chocolate-dipped items, we will only ship your package via UPS to ensure Next Day (Hawaii) and 2nd Day (Continental U.S.) delivery to your destination, and we will only ship products Monday through Wednesday (Continental U.S.) and Monday through Thursday (Hawaii). For general information about shipping, click here. 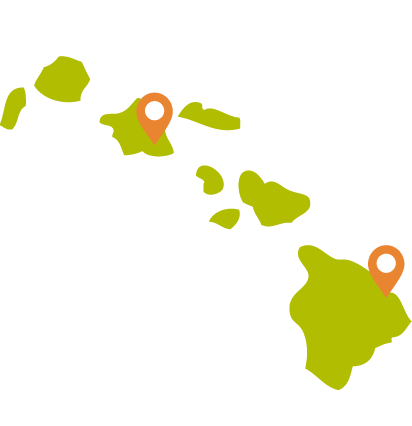 While our retail locations are exclusive to Hilo, Hawaii, and on the island of Oahu at Ala Moana Center, Street level 1, Center Court near Centerstage, we are able to ship most of our products all over the United States, as well as to Canada, Japan or another international destination (please call our customer-service department for a shipping quote). Your order will be sent promptly based on when it was received and the next available ship date, generally within three (3) business days. During the Holiday Season we reserve the right to select the next available ship dates. Addresses within the State of Hawaii will be delivered the next business day once shipped. Orders to the Continental U.S. will be delivered by the second business day once shipped. Orders are normally shipped via UPS. Please note: Shipping delays may occur due to uncontrolled weather conditions. Am I able to ship to an APO/FPO address? We do ship to APO/FPO addresses, however, we cannot guarantee the amount of time that it will take to have the parcel delivered or the condition of the product once it’s received. Please call our customer service department for assistance. UPS My Choice is an innovative new service that provides receivers of UPS home-package deliveries to get free delivery alerts by email, voice or text message the day before delivery about when the package will arrive. Once you’ve signed up, you can manage your deliveries, reroute a package, reschedule, or authorize a shipment release if you won’t be home. Log in to www.ups.com/mychoice to register. Do you ship internationally? How much is the delivery cost? We ship to all 50 states, Canada and Japan. For an estimate regarding the shipping cost to Canada, Japan or another country, please call our customer-service department. Are we able to ship to our hotel during our stay? Provide us with ample time, as well as the name and address of your hotel, the dates of your stay, the name under which your reservation is listed, and we can send the order to your hotel.